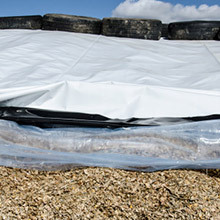 Siloseal is a new generation clamp sheet that sits directly beneath the traditional silage sheet. Compared with conventional sheeting, Siloseal is a thin, flexible low permeability film. It is specially designed to closely follow and cling to the clamp surface where it prevents pockets of trapped air to significantly reduce aerobic spoilage on the top and shoulders. Siloseal provides an effective air seal and creates the right anaerobic conditions, it also facilitates a faster, more efficient fermentation process to deliver enhanced silage quality. Ideal for ‘moist’ crops with a greater potential for spoilage. ‘Clings’ to the surface of the clamp. A more effective air ‘seal’ aids quicker fermentation of silage. Reduces top and shoulder losses in the clamp.